Art & Frame of Sarasota: Have You Tried: Gamblin Art Sketching Oils? Gamblin Art Sketching Oils are made in the traditional manner, like in the studios of the Old Masters, where student oil colors were made by removing half the colored pigments and replacing them with marble dust (aka calcium carbonate). Because colored pigments are the only expensive ingredient of oil paints, the only way to make oil colors more affordable is to take out a portion of the colored pigments. Made to accommodate students who need inexpensive yet clean and workable oils, Gamblin Art Sketching Oils are made from the same pure colored pigments that are used to make Gamblin Artist Colors. Gamblin uses exactly half the same pure colored pigments and extends them with high quality colorless pigments like calcium carbonate. Then they add driers because extenders slow the natural drying time of linseed oil and students want their paintings to dry quickly. Though extenders are used, no chemical additives such as anti-skinning agents or rheological agents are used. When students finish their experimentation and begin preparing art work for thesis or exhibition, they can easily transition to artist grade oil colors which are made from the same pigments as their student oils. 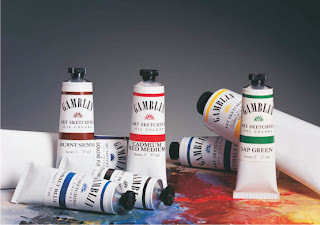 Gamblin Art Sketching Oils are compatible with all oil painting mediums and other brands of student grade oils! If you are looking for an artist grade paint that dries faster than traditional artist oils you may want to try Gamblin Fastmatte Oils. Watch the video below to see them in action! Have you tried Gamblin's Art Sketching Oils? Tell us what you think about them by commenting on this post! There's no need to sign up--just click the link that says comments---we want to hear from you!